If you are a fan of The Main Street Mouse then you have probably heard Michele or Scott talk about Trail’s End a few times. I honestly did not know about this place until they told me about it and now my family is hooked. Breakfast, Brunch, or Dinner, this place is delicious. Trail’s End is just a boat ride away from the Magic Kingdom. Just steps from the dock, nestled in the trees of Fort Wilderness, is this hidden gem of a restaurant. They offer a daily breakfast and dinner buffet and on select days even brunch. The dining area is very rustic with mounted animals on the wall, beamed ceilings and split log walls. It really takes you back to the pioneer days. Let’s start with the breakfast buffet, which my kids absolutely love. They offer everything from Mickey waffles, to biscuits and gravy, and everything in between. You will ceretainly not leave hungry. We always make our reservation for late breakfast so that we can skip lunch and tide us all the way over to dinner time. They have a huge assortment of pastries, bagels, and even cereal. They have a cold assortment of fruit, yogurt, cheeses, and smoked salmon. Hot items include my favorite, french toast bread pudding as well as Mickey waffles, scrambled eggs, cowboy eggs benedict, oatmeal, sausage, and of course bacon. If your mouth is not already watering, let’s move on to the dinner buffet. 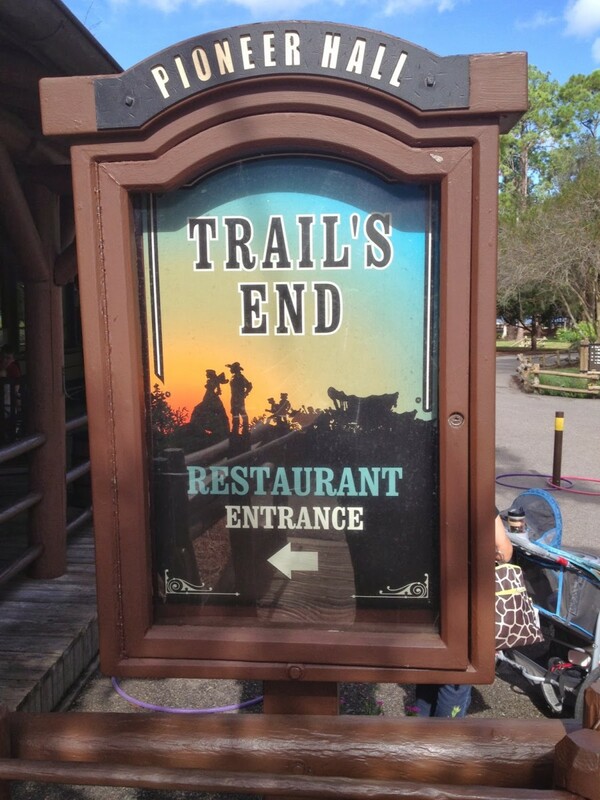 If you have ever eaten at the Hoop-Dee-Doo and had their amazing fried chicken and ribs, you are going to love Trail’s End because they have an endless supply of those items and so much more. The cold bar offers salad, a variety of fruit, some specialty salads, marinated mushrooms, and peal and eat shrimp, just to name a few. Warm entrees include, macaroni and cheese, cowboy baked beans, homemade mashed potatoes, a variety of hot vegetables, fried chicken and ribs, a carving station, and build your own baked potatoes. They also have pizza, chili, cornbread and other breads. And we can’t forget about dessert. They have plenty to choose from if you still have room. They have an ice cream machine and toppings as well as a hot apple crumble, cookies, strawberry shortcake and so much more. This place certainly has something for everyone. The best part is the price. It’s probably one of the lowest priced buffets on property, but it’s also got some of the best food. They do accept all kinds of dining discounts. 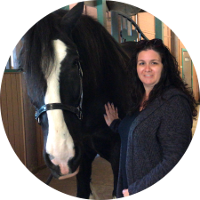 One of my family’s other favorite thing about eating at Trail’s End for Breakfast, Brunch, or Dinner is to visit the horses and ponies that are just steps away from the restaurant. So what are you waiting for? Go book a reservation and give them a try.